IoT in Retail Market size was valued at over USD 9 billion in 2016 and will grow at more than 19% CAGR estimation from 2017 to 2024. Growing need to enhance the in-store customer experience will drive the adoption of IoT in retail market over the forecast timeframe. The implementation of IoT across retail sector is expected to propel innovation in stores, improve the overall experience, and deliver offers and promotions based on browsing and purchase history. Increasing penetration across applications such as digital signage, payment and supply chain management contributes to the industry growth. Issues associated with data privacy & security is expected to hamper the IoT in retail market growth over the forecast timeline. The hardware & software components in the network are prone to cyber-attacks such as Distributed Denial of Service (DDoS), which is predicted to curb the demand. High implementation cost coupled with compatibility of devices and lack of common standards for IoT solutions are among the other challenges faced by the retailers. Device management platform enables the industry players to collect, collate and analyze these data, contributing to the significant market share of such platforms in the IoT in retail market. Large volume of data is generated on a daily basis, raising the requirement for advanced data management tools. However, network management platform is expected to witness significant growth owing to the increasing demand of management of devices operating in the system. Enhancements in the beacon technology is anticipated to positively impact the industry. This is attributed to the capability of beacons to provide unprecedented insight into the buying behavior, sending notifications to customers while entering the store. 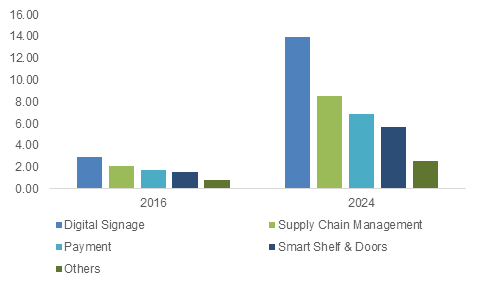 Increasing penetration of advanced technologies such as sensors, RFID tags is expected to drive the IoT in retail market. RFID tags are anticipated to witness significant growth owing to the rising adoption of such components in the retail sector owing to the benefits of RFID tags include fraud prevention, analyzing customer behavior and inventory management. Bluetooth Low Energy (BLE) is anticipated to grow considerably due to the increasing usage of the technology by retailers and marketers. It has huge potential to grow in the customer engagement & marketing verticals followed by contactless payments. As compared to Bluetooth, BLE uses much less power and are used for applications requiring exchange of less amount of data over shorter distances. Other connectivity technologies such as NFC have gained popularity and are used for understanding customer preferences. Hardware segment dominated the IoT in retail market with majority of the revenue share whereas the software segment is predicted to witness strong growth due to the increasing implementation of software solutions and applications across the retail industry. Also, the gradual rise in the use of mobile applications contributes to the strong growth of the software segment. Increasing adoption of IoT by the retailers can be attributed to the falling prices of RFID & sensors. In the retail sector, RFID tags are used for various purposes which include tracking inventory, more availability of items on-shelf, reducing theft, eliminate the possibility of out-of-stocks and improving the overall store operations. Tracking the customer’s real-time shopping behavior thereby using it to notify them regarding offers are among the other IoT functionalities. Managed services segment is anticipated to witness considerable growth over the forecast timeline. This can be attributed to the rising focus to considerably reduce the in-house IT costs, allowing internal IT staffs to focus more on the core competencies. In order to eliminate the possibility of data security threats, managed service providers are highly investing in data security & protection. The adoption of surveillance analytics helps retailers gain invaluable information about their customers. Video analytics are becoming increasingly popular among retailers to streamline the operations. The increasing need for specific solutions such as inventory management and product performance analytics has encouraged buyers to implement niche solutions. Digital signage applications in the IoT in retail market are anticipated to witness high growth over the years owing to the rising focus of the retailers to provide innovative & interactive shopping experience, leaving an impression on the shopper. It is helping the marketers to save costs related to traditional print media, making it less time-consuming for the advertisement to be made available to the masses. Signage solution such as intuitive touchscreen providing customers with personalized content is expected to drive the IoT in retail market. With interactive signage solutions, customer engagement can be taken to a new level where relevant & personalized content, recommendations will be provided along with wayfinding around the stores. U.S. IoT in retail market accounted for majority of the overall revenue share, which is due to the high investments in the IoT infrastructure. Asia Pacific is expected to grow significantly owing to the rapidly improving infrastructure in the economies such as China & India coupled with the rising disposable income. Increasing usage of smart devices followed by the developing e-commerce industry will drive the IoT in retail market in the region. The solutions are mainly implemented by the retailers for payment services, fast check-out lines thus improving the customer experience. 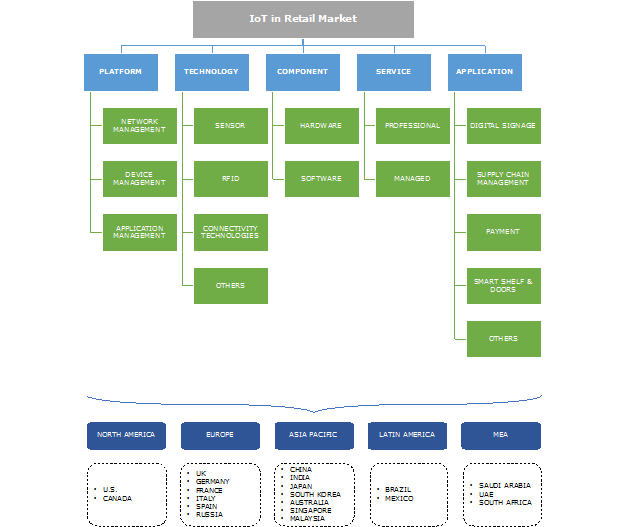 Industry players in the IoT in retail market include Intel Corporation Inc., Microsoft Corporation, IBM Corporation, Cisco Systems, SAP AG and Zebra Technologies. The industry is fragmented with the entry of new players with innovative products and advanced technologies. Strategies followed by the industry players include mergers & acquisitions, new product launches in order to achieve growth and enter into new markets. The industry players are following various strategies such as mergers & acquisition, new product development & innovations investing heavily to gain majority of market share. To gain a competitive advantage, players in the retail space are adopting such solutions in order to increase the interaction with their customers. The technology is mainly used by retailers to enhance the customer experience, understand the in-store customer behavior, monitoring the assets and keep a track on the supply chain network. With increasing need to create effective in-store marketing strategies and determine customer behavior, retailers are increasingly focused on implementing retail analytics solutions. The increasing need for specific solutions such as inventory management and product performance analytics has encouraged retailers to implement niche solutions. The reluctance of retailers followed by lack of skills and expertise are expected to pose threat to the industry.